Here is a recent Ivoclar Vivadent Bio-Functional Prosthetic System denture which came into the laboratory from one of our dentists this week. 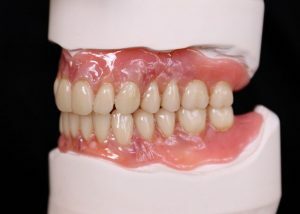 The patient requested that we give the denture a customised look, as their previous denture had colour tone staining on the gingiva baseplate. 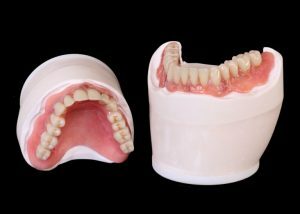 Using Ivoclar’s SR Nexco Paste Composite, it has allowed us to achieve a life like appearance to the finished denture for the patient. The newly released Ivoclar Vivadent SR Vivodent S PE anterior and SR Orthotyp S PE posterior teeth, also helped in the final result, as the quality and morphology of the teeth were given great patient feedback even at the try-in stage. If you would like more information on our level of prosthetic work we can offer, please call to discuss your needs. © 2019 Hughes Dental Laboratory. All Rights Reserved.